The gold days of autumn soon turn into the chill of winter. But there is always something sparking in the garden. Snowdrops and crocuses bravely push thier fragule stems through thte frozen ground, while ice crystals glisten on the wings of winter faeries as the tend thier plants in the cold, clear light. HAWTHORN sits waiting for some freindly birds to come by. they love his juicy red berries. The HOLLY faerie is pround that his leaves stay green in winter, when most others turn brown. he pareads his scarlet berries, knowing that thye will soon be picked to make wreathcs and other decorations to celebrate the most magickal time-CHRISTMAS! THe beautiful SNOWDROP faerie never feels the cold even though she is barefoot, she is a true winter faeie who love sthe cold crisp feel of snow and ice. 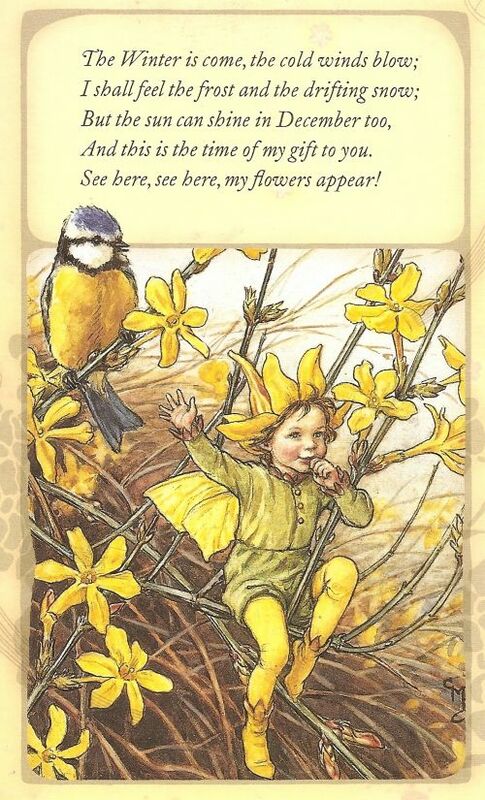 THe bight yellow flower of the WINTER JASMINE faerie bring a touch of golden cheer to the bleak winter landscape. What is a Flower Faerie?